Fascinating location, great decor and outstanding Thai fare makes Royal Orchid one of the best sites to enjoy regional cuisines of Thailand in Dubai. The exciting flavours and exotic aroma of these Thai dishes offered at this bistro will give you an unforgettable experience that will entice you to come to this restaurant time and again. There are countless inspiring dishes that you will find on the menu of Royal Orchid Restaurant, which includes fried dishes, egg and vegetarian options along with poultry and meats. In brief, one rarely expects this kind of excellent food and quick service in a restaurant that has nominal prices. Royal Orchid Restaurant specializes in producing authentic Thai food that is served to the guests from brunch time till midnight daily. As far as the specialty of this bistro is concerned, Singapore chilli crab is one of the stand-out dishes of this eating place. Brunch and outdoor seating facility makes this venue even more enticing for the crowd. Apart from this, they also offer takeaway service. So it would not be a problem for anyone to relish delicious Thai fare varieties of this bistro at their own place. The daily opening hours of Royal Orchid Restaurant in Dubai Marina are from 11:30 am to 11:30 pm. Marina Walk, Dubai Marina - Dubai - United Arab Emirates. 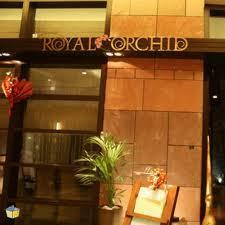 Royal Orchid Restaurant in Dubai Marina has no metro station within its 2.5 kilometres radius. Therefore, car or bus are the best means to reach this spot. 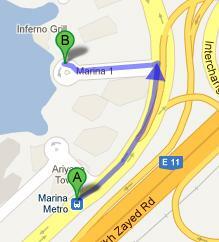 Marina Metro Station – Dubai bus stop is 550 meters away from the Royal Orchid Restaurant. So, people on foot can bridge this distance in about 7 minutes time frame. All bus users need to do is to take bus number F37 and reach this bus stop, then head out in the northeast direction and turn left, where the destination is located on the right side. See map for directions.